EURO 2020 kicks off on the 12th of June in 2020 and ends on the 12th of July with a final in Wembley Stadium. The precice schedule will be announced after the groups are drawn. The opening game will be held at Rome on a stadium called Stadio Olimpico. It will begin 21:00 CET. 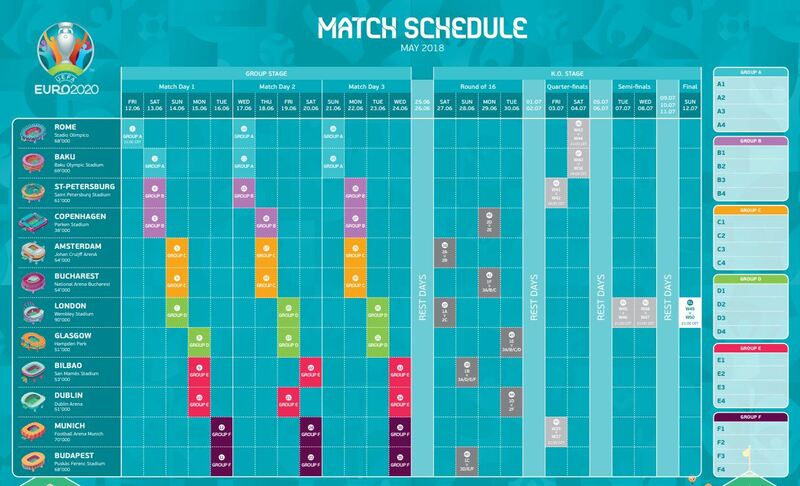 After that there will be 2 to 4 games played every day until the 24th of June. 25th and 26th of June will be days off. The 1st and 2nd of July are days off. The 5th and 6th of July are days off. The 9th, 10th and 11th of July are days off. All the times are according to the Central European Timezone.